Curb appeal: it is just a fancy way to say first impression. The curb appeal of your home is the first impression it gives to your guests. And did you know it takes just 7 seconds for someone to form a first impression? So what kind of first impression is your home giving? Edging: Edging gives your driveway and walkways a crisp, elegant look, instantly improving curb appeal. And it is a fairly simple and cost-effective home improvement project, as well. This means you will get more bang for your buck. Landscape Lighting: Just a little additional lighting can really accent your landscape and make it pop. It is amazing the difference landscape lighting can make! Flowers: An oldie but a goodie, flowers are a quick and easy way to spruce up any landscape. Garage Door: An old garage door could be impacting your curb appeal more than you know. Consider upgrading your old, dingy garage door. You will be surprised at the difference it will make. Front Door: Your front door is the focal point of your home. It is the entranceway into your life. It also plays a major role in the curb appeal of your home. So consider giving your front door a facelift. A fresh coat of paint and new hardware can work wonders. Mailbox: Yes, your mailbox. Believe it or not, that old, ratty mailbox could be detracting from your otherwise beautiful home. Landscape: Don’t let trees and bushes run wild. Make sure to trim both regularly to give your home a much more elegant look. 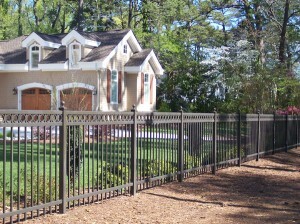 Invest in a New Fence: A new fence can give your home and your landscape an instant face lift. And who better to install this new fence than Hercules Fence? For more than 50 years, we have been providing exceptional fence services to the people of Northern Virginia and the surrounding area. Let us help you transform your home! If you have any questions about our blog, “Improve the Curb Appeal of Your Home with a New Fence,” please contact Hercules Fence of Manassas, Virginia today by calling (703)551-2609 or visiting our website. Also, check out Hercules Fence of Manassas on Facebook,Twitter, Google+ and YouTube! This entry was posted on Friday, June 7th, 2013 at 5:08 pm. Both comments and pings are currently closed.